Ratchet & Clank Duo © Insomniac Games. Ratchet & Clank is back at it again, returning from it’s original story line and bringing some intense graphics exclusively to the Playstation 4. The concept of this game remains the same as the earlier 2002 version – Ratchet the heroic Lombax, meets Clank the Zoni-Robot and together they fight evil through the Solana galaxy. I have had my hands on this game since release date (April 12, 2016) and I must admit, I’ve looked forward to playing it nearly every day since. Although I can see this game not being everyone’s taste, I can surely vouch for those who are – This game is what I’ve been waiting for! This game brings back a sense of nostalgia, running through the different planets, collecting bolts, smashing crates and killing enemies along the way. The cutscenes were enjoyable, yet a bit overbearing at times. This game consists of over an hours worth of cutscenes, which truly does make you feel like you’re playing an interactive movie. 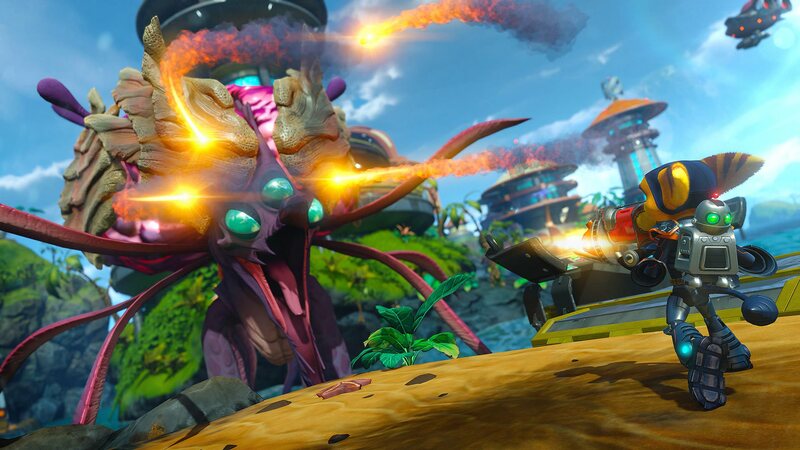 Ratchet & Clank features many of the old weapons, along with a few exciting new – including the Pixelizer which fires blasts of green energy causing the enemies to pixilate. This is by far one of my favourite weapons. Watching the enemies around you turn into large green pixels, and seeing all of the bolts gravitate towards you, make this a thrilling experience. This is an enjoyable game to play if you want to fully immerse yourself in the video game world. While playing you really do feel like you are a part of the game. This is a great game for all ages, and I’m excited to see the younger generation become more aware of the great games from many years ago. The Ratchet & Clank movie is a great addition to the game, telling the story of the heroic duo, fighting to stop an evil alien named Chairman Drek from destroying every planet in the Solana Galaxy. Ratchet & Clank find a dangerous weapon capable of destroying entire planets, which then causes them to join forces to save the galaxy with The Galactic Rangers, the team Ratchet dreamed of being a part of. This movie is basically all of the cutscenes from the game stitched together with a few added bonuses. I suggest playing the game all the way through before watching the movie, unless you don’t mind cutscene spoilers. The beginning of the movie to me personally was quite dry, but that being said – I had played the game previously. The movie does start to pick up as you become more invested in the character and the whole time I was eager to leave to play the game. The ‘witty’ jokes in the movie are definitely geared towards a younger audience, but still had me on my seat as I knew that, that is what it was intended for. The voice acting cast was phenomenal throughout the movie and game, and was pleasantly surprised to hear Bella Thorne as Cora. The Ratchet & Clank movie and game duo is definitely a unique experience that I recommend to all gamers. The pair makes you invested in the game, and really embraces you in the story line. This is just the start to many video game movies to come.